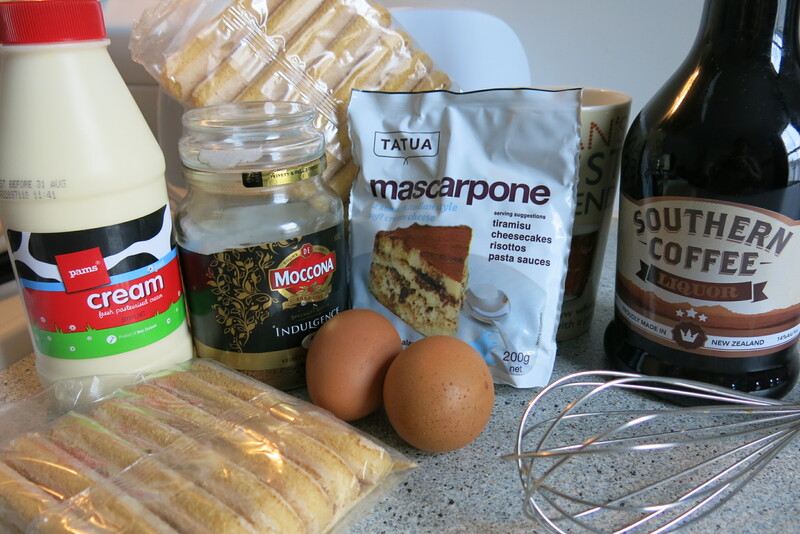 I love Tiramisu and have always wanted to make my own instead of paying an arm and a leg for a little slice of heaven. So, when the opportunity came up for me to try my hand at making a batch (there were a couple of bags of Savioradi Ladyfingers in the cupboard that had to be used up) , I went in and grabbed it. So this morning, after securing a small pouch of Mascarpone Cheese and a small bottle of cream, I set about preparing this delectable dessert. There are a lot of Tiramisu recipes on the internet and I didn’t know which one to follow. Should I follow Nigella’s recipe, or Jamie Oliver’s? So many choices!! In the end, I opted to do this one simply because it didn’t require a big tub of Mascarpone, and only needed 2 eggs. Admittedly the recipe seemed to require three times the number of mixing bowls than the others, but heck – there are lots of mixing bowls in the cupboard too anyway. So I began. I only used 200g of Mascarpone cheese. I mean, seriously, should I buy two packs just for the extra 50gms. Again, the kuripot in me won. After i made the coffee and lined the springform pan with wax paper, I then separated the eggs (as instructed in The Recipe) and beat the egg yolks and sugar until the mixture became pale and thick. When the mixture looked pale and thick enough (I have absolutely no idea if I was doing this right because, this is my first attempt), I added the Mascarpone and continued mixing until everything was nicely incorporated. I then set this aside while I measured 1 cup of cream and whipped the living daylights out of it until the stiff peaks held. To be totally honest, I think I mixed it a wee bit too much – but again, please don’t tell anyone. 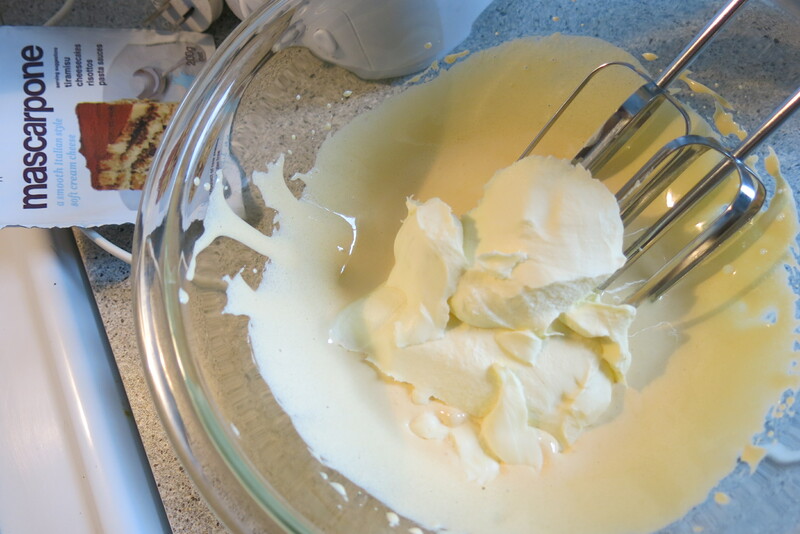 I then folded (yes, I still know how to “fold” ingredients in) the freshly whipped cream in the egg and mascarpone mixture. I then set this aside because now, I had to give those egg whites a good beating. When soft peaks formed, I stopped and folded this in the egg yolk and mascarpone and whipped cream mixture. I then dipped the ladyfingers into the coffee and coffee liqueur mixture and placed a layer on my pre-lined springform pan. 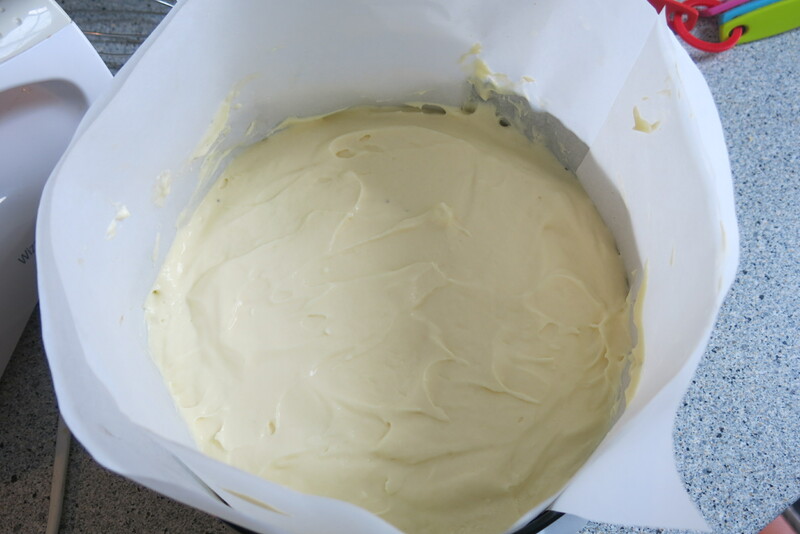 Once the base was covered with coffee-soaked-ladyfingers, I then put half of the mascarpone cream mixture on top and did my darndest to spread the cream evenly. When I was satisfied with how the cream covered the ladyfingers, I did more dipping and laying to create another layer of coffee-soaked-ladyfingers – then covered these with the remaining mascarpone mixture. That image on the left is the semi-finished Tiramisu. All I need to do now is dust the top with cocoa powder. I don’t know why there are a few big chunks of cocoa powder on the cake. My sieve must not be fine enough for this. 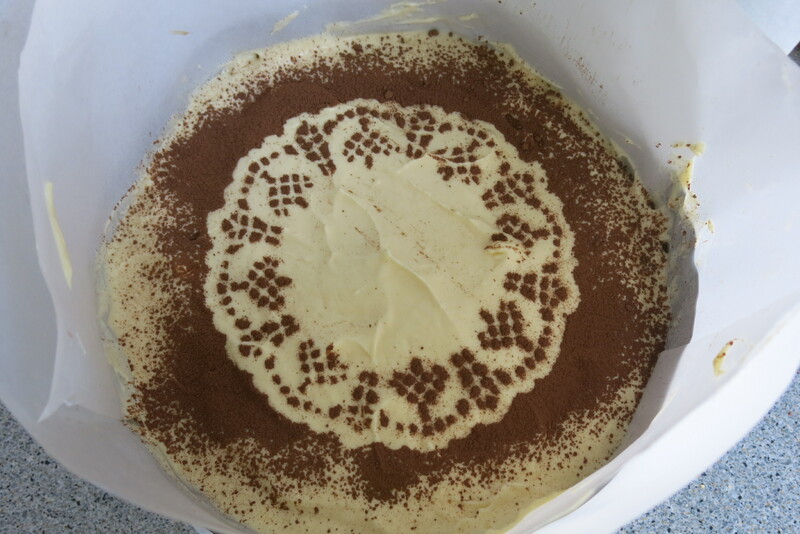 Anyway – the Tiramisu is now sitting quietly in the fridge. I’m hoping the cream and cheese and egg white mixture holds up and doesn’t separate. I’d be mortified if it did. 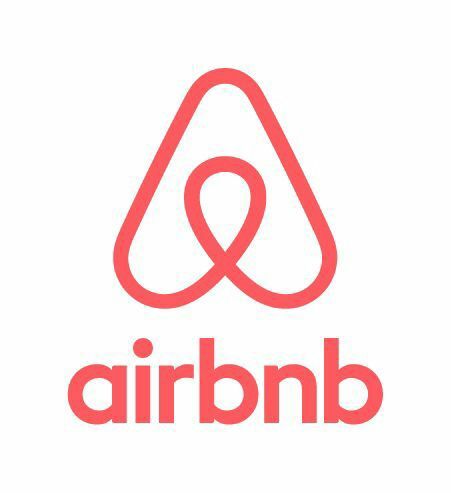 It looks … alright. I tasted a bit of the cream mixture before I washed the spatula, and it was okay. 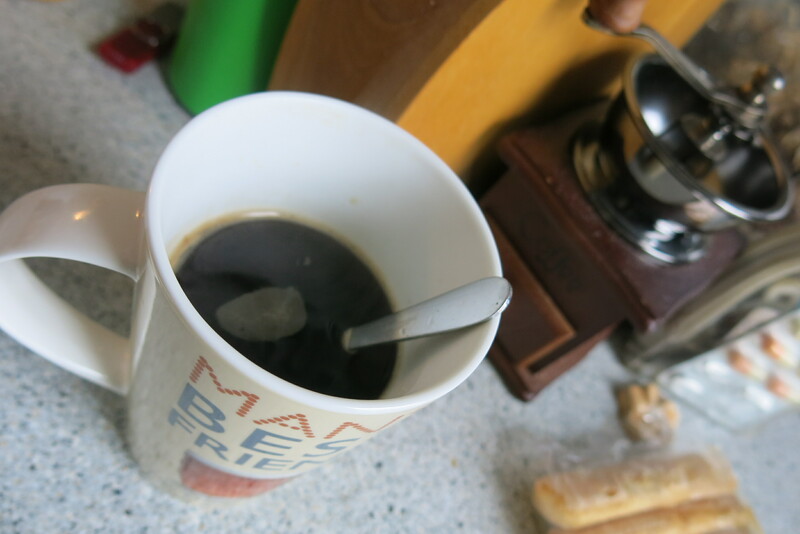 I wasn’t able to taste the coffee and liqueur mixture though. I hope it isn’t too bitter. So that’s it. That’s my adventure on this Sunny Saturday afternoon. Tomorrow, I’ll find out whether this attempt’s a successful one, or not. Hi. It turned out pretty good. 🙂 Thanks. Will try that again but will use sponge cake layers instead of lady fingers.